Established in Aberdeen and Copenhagen based on the business concept "Equity Stake in return for Technical Expertise". Entry to Western Ireland, Frontier Exploration Licences (20% equity) Blocks 35/8,9 and Blocks 44/18, 23, 24, 29, 30. UKCS 23rd Round - Blocks 211/18b and 211/8b (20% equity). Farmout of Quad 44 W Ireland Frontier License to ExxonMobil. AMI over South Porcupine Basin with ExxonMobil and Providence. New Frontier Exploration Proposals submitted to PAD. 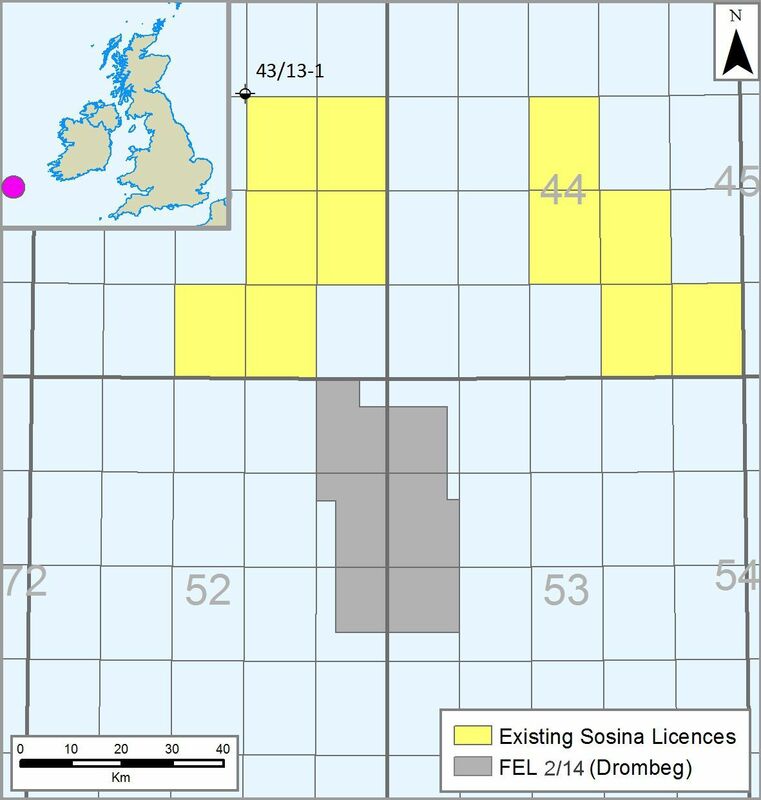 UKCS 24th Round - awarded one license Block 21/16b with Elixir Petroleum and DNO. Farmout of UKCS Block 211/18b to RWE Dea. Farmin to Celtic Sea Licences. Drilling and oil discovery in the Celtic Sea. Irish Licensing Round - SOSINA is awarded three Licences in the Porcupine Basin. Celtic Sea drilling - hydrocarbon presence lower than expected. ExxonMobil replaces Providence Resources as operator on Dunquin and is named operator of Drombeg. A 2D seismic acquisition over Drombeg is commenced. Chrysaor farms into the North Porcupine Licences. The Dunquin partners - among them SOSINA - commit to drilling a well. The Spanish Point 3D seismic survey a warded, pursued and completed. The result of the Spanish Point 3D studies advance the discovery towards commercial development. Nautical Petroleum farms into the Nemo oil discovery. The Spanish Point partners - among them SOSINA - commit to drilling a well. 3D seismic survey completed for FEL 4/08. SOSINA awarded three new licencies in the 2011 Irish Atlantic Margin Round. Identification and study of the Drombeg Cretaceous anomaly. Site survey operations at the Spanish point well site. Two changes of operatorships. New operators are Repsol at Newgrange and Chrysaor at Spanish Point. Commencement of the Dunquin well activities. Drilling of the Dunquin North exploration well. Cairn Energy farms-in and becomes operators of the Spanish point licence. The contract for drilling the Spanish Point appraisal well using the rig Blackford Dolphin signed. ABT Oil & Gas farms into the Helvick and Dunmore discoveries. Conversion from LO to FEL for the Drombeg, Spanish Point South and Newgrange licencies offered to SOSINA. Seismic surveys of the Drombeg, Spanish Point South and Newgrange licencies done. New 3D seismic data confirm the presence of Druid. New 3D seismic data indicate the presence of a significant Paleocene deep-water channelized system in the Spanish Point South (later named Ruadhan) area. New 2D seismic data confirm the presence of the large Cretaceous four-way dip closure on the Newgrange prospect. Providence Resources/SOSINA and Schlumberger in cooperation completes the analysis of the 3D seismic responses from the Druid and Drombeg prospects. The Avalon licence option (LO) is offered to SOSINA/Providence Resources. Providence Resources/SOSINA and Schlumberger in cooperation discloses that the Newgrange prospect comprises a prospective resource potential of c. 13.6 TSCF GIIP or c. 9.2 BBO STOIIP.